I’ve always been a fan of restaurants that specialize in one or two things. Katsu restaurants in Japan that serve perfectly crisp pork, beef, and chicken cutlets accompanied by shredded cabbage dressed with bright ponzu sauce and grated radish. Tiny noodle joints throughout Asia where all the cook’s energy goes into turning out the most flavorful broth imaginable. A limited menu means cooks master dishes and the restaurant is forced to make its name (and income) on its specialty. For Lighthouse Tofu, soondubu jjigae (extra soft tofu soup) is that dish. The Annandale location is nestled in a cluster of buildings on a small road off Columbia Pike, one block away from the wildly popular Annandale spot, Honey Pig. Like most ethnic restaurants, the attention here is focused on the food rather than the esthetics. Simple wooden tables, chairs and benches line walls that are covered in old Korean script. Service is friendly and prompt. Waitresses dressed in simple traditional outfits are proficient in English and happy to answer any questions or provide you with a second helping of your favorite banchan– Korean side dishes. A meal always starts with a cup of roasted barley tea. I haven’t quite figured out the science behind when one receives hot versus cold tea, ice or no ice, but I’m pretty certain it has something to do with your waitress’ perceptions of your foreigner-ness. The whiter you are, the colder your tea. Scanning the limited menu will take you all of one minute. Focus on the tofu soup first. What do you want in the soup? Mushrooms? Beef? Pork? Seafood? Some kind of combination? Second, what level of heat can you handle? Two years of frequenting this spot and my choice is now consistent. Mushroom—spicy, spicy. After deciding on the soup, build on to the meal by ordering one of the Korean style pancakes. The small is enough for two people to share; order the large if there are three or more dining with you. Both the seafood and kimchi with pork are good options. To be honest, I prefer the pancake at Honey Pig because their batter is lighter, resulting in a crispier edge. However, the pancakes here are still excellent although slightly denser. 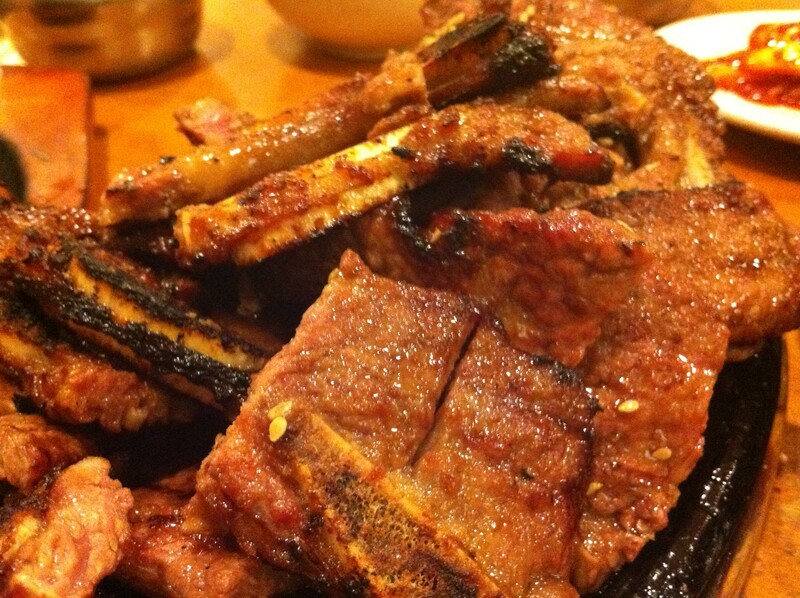 Continue down the tiny menu and select galbi – deeply caramelized slices of marinated bone-in short rib. With its seared edges and meaty flavor, this succulent dish beats out the more ordinary bulgogi. 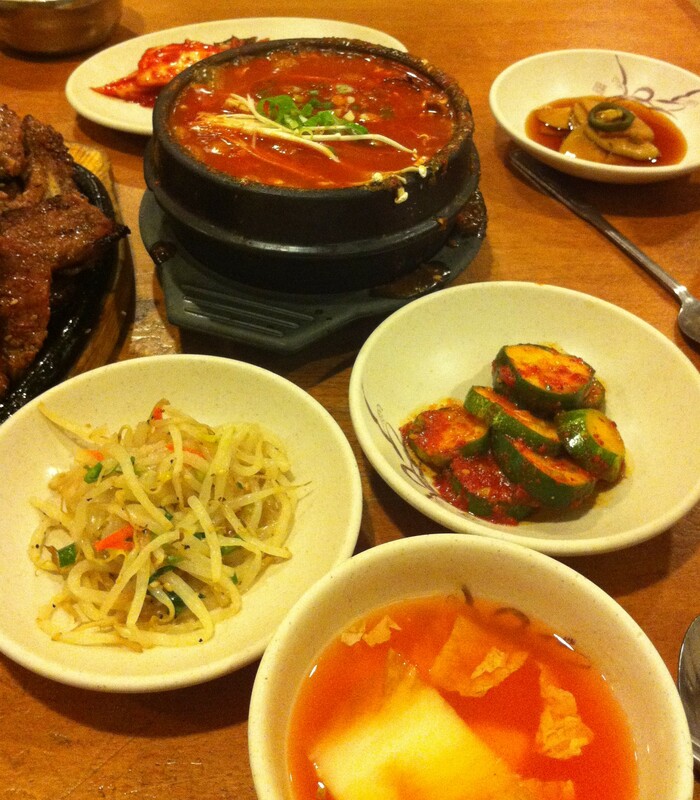 As with all Korean spots, meals at Lighthouse Tofu are accompanied by banchan. Standouts of these side dishes include lightly pickled cucumber with chili paste, bean sprout salad with scallions and sesame seeds, and a cold cabbage and radish soup. The house kimchi is pickled with oysters; slightly slimy and flaccid—at the end of the every meal it alone remains untouched. The chopped clam with minced garlic and green chilies was my all-time favorite. The salty-spicy mix added an extra punch to each bite of the tofu soup. Unfortunately, the more expensive clam banchan has been replaced by boring chayote slices in a light dashi flavored marinade. But never mind the small misses. Once you taste the hot tofu, you will be smiling once again. 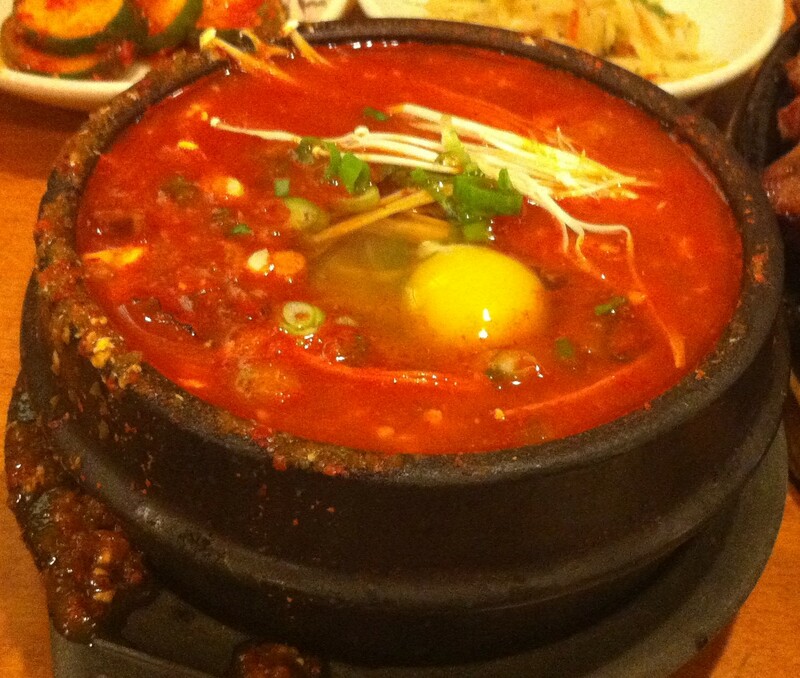 More of a stew than a soup, the soondubu arrives bubbling and steaming in a black cast iron bowl. Peek into the kitchen and you’ll understand why. Flames lap all around the individual bowls, heating the stew and bowl thoroughly so that it stays warm throughout the meal. The tofu is soft, with a slight jiggle like that of well-made custard. Shiitakes impart an earthy flavor while enoki mushrooms grace the top of the stew waiting to be mixed in and enjoyed for their textural contrast. Crack in the raw egg that was brought to the table with the banchan, and mix it through. It adds a nice creamy touch and rounds out the flavors. The stew is hearty and spicy but also velvety from the silken tofu; a rare combination to find in a single dish. Lighthouse Tofu may not be as popular as the more meat heavy Korean joints. Tofu isn’t typically the lead actor in our food fantasies. However, I urge fans of good food to head over to Annandale on a cold night and warm up with BBQ ribs and what is definitely some of the best soondubu around.